In addition to being a history nerd, I am also a geological-earthquake-tsunami dork. Tsunamis travel across deep ocean about 500-600 mph, or about the speed of a airliner. Here’s a rather incredible plot of tsunami travel times from the NOAA’s West Coast Tsunami Watch Center. Thanks to the curvature of our angry planet, waves from Chilean earthquake hit SF, Hawaii and Australia at the same time, about 15 hours after the earthquake. You can clearly see the ‘drag’ of the coastline and islands. 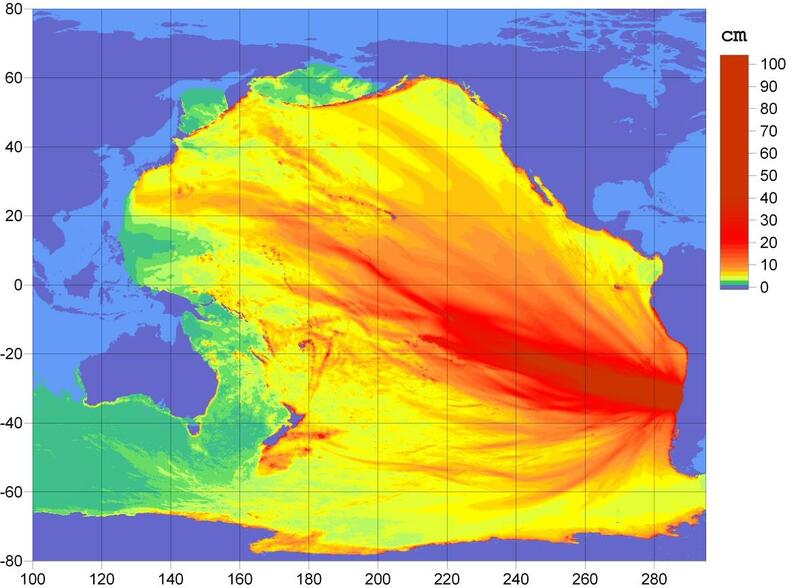 And here’s a tsunami “energy map” — red tendrils are bad. As you can see, it’s not evenly distributed. Data for tide gauges is readily available online, and worldwide reported tsunami wave heights are published by the various tsunami watch agencies. 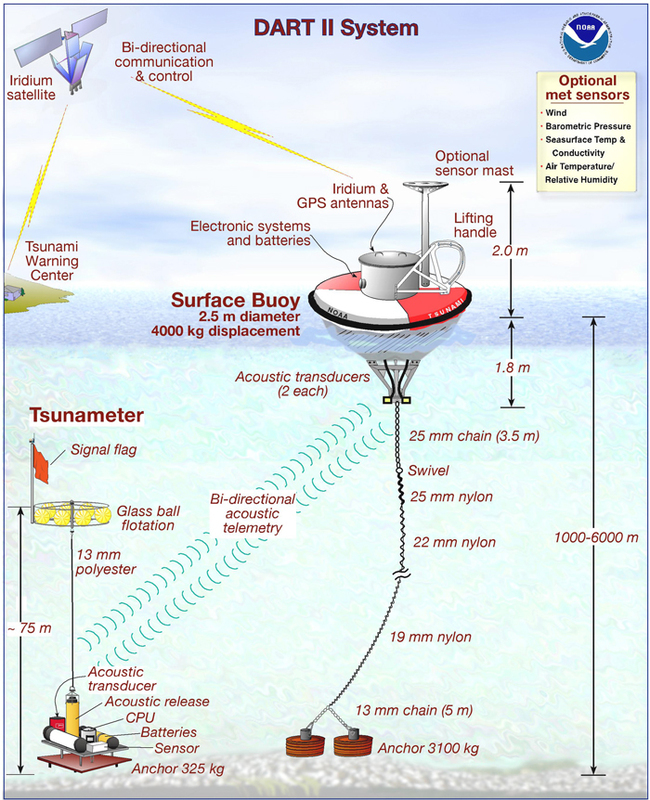 In addition to the coastal measurements, the US government has graciously peppered the oceans with “DART” buoys and sensors which can detect tsunamis as small as 1 cm by measuring changes in water pressure on the ocean floor. Here we see the readout from a DART buoy about 500 miles off the coast of Peru from the day of the earthquake. The smooth blue curve on the left shows the normal ebb and flow of the tide. I’m no tsunamologist, but in the center of the chart you can see the first tsunami wave hit around 10 GMT. And I’m no seismologist, but I think the big red spike just before 7 GMT is the earthquake itself. Here’s the plot of the DART buoy off the coast of Hawaii showing the multiple tsunami waves passing through 14 hours later. You’re basically seeing the ocean ringing like a bell. And here’s a Japanese tide gauge showing a (1.5m?) tsunami hitting Hokkaido, 24 hours after the earthquake. This was small by tsunami standards, though wave height is greatly dependent on local conditions – note the difference between the LA and SF readings, the energy map, and the height of waves half a world away. Somewhere I’ve seen a picture of Crescent Beach after the 1964 Alaskan earthquake — a playground jungle gym had the living crap beaten out of it. 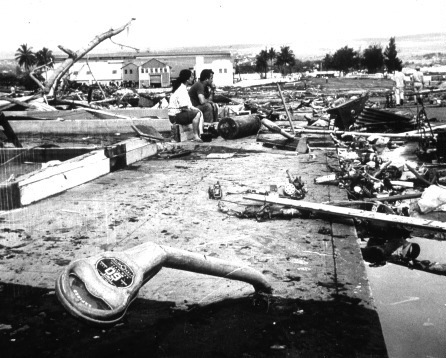 Here’s a picture of parking meters in Hilo after the 1960 9.5 Chilean earthquake. Moral of the story is don’t assume it’s over after the first wave, and don’t run down onto the beach did if you see the water rush out to sea like those poor bastards in Thailand did.